At the end of a short and intense Farr 40 One Design Trophy regatta on Sydney Harbour, the fleet beat the southerly burst moving up the NSW coast at 35 knots and Lloyd Clark’s Voodoo Chile beat the fleet by three points having taken Transfusion to the protest room, where both boats were disqualified from a game changing race six. Guido Belgiorno-Nettis’ Transfusion and Voodoo were scrubbed by the jury from race six for a mark incident and in the re-sorting process Voodoo moved from second by one point to first by three points. “Guido and myself and Andrew (Voodoo co-owner) have a great rivalry, but we are good friends. After the hearing result was announced Guido and I had a little hug and a chat,” Clark stated. “We always prefer the results to be sorted out on the water, but that’s part of the sport. 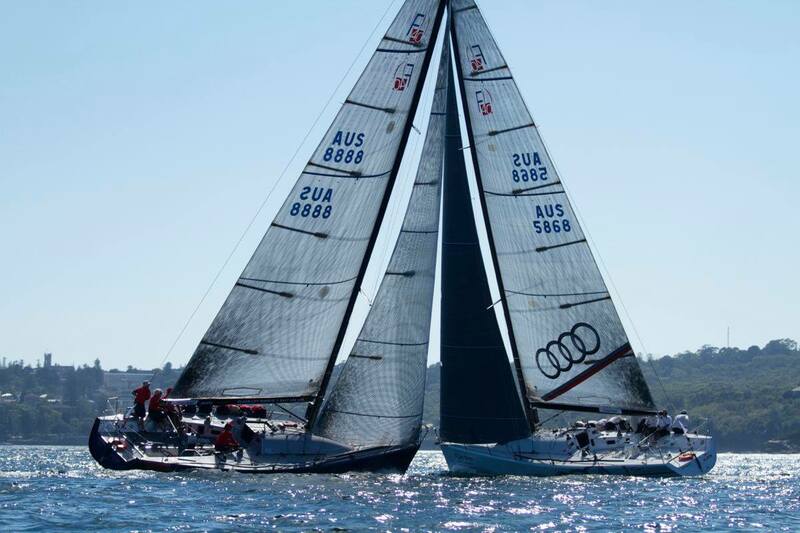 “We’ve now won back to back One Design Trophy’s out of Middle Harbour and to be a Corinthian entry all the way from Tasmania on the podium again gives me a lot of satisfaction for our amateur crew.” In 2014 Voodoo won from Transfusion on a countback; this time a protest and three points separated the duelling pair. The hearing delayed final results and though it “seemed an eternity” for Clark and tactician David Chapman, who presented Voodoo’s case, the wait was well worth it for the Tassie skipper who made an epic comeback to Farr 40 racing this weekend following a seven month absence from the helm. That’s one victory to Transfusion from the current season’s three point-earning stages, in Victoria at the beginning of February, and today, Sunday March 1, the Taswegians netted the second. One apiece going into next month’s NSW title and Australian championship guarantees the duo will lock horns when they next bang the start line. Transfusion’s Sydney crew, led by the multiple Australian class champion and one-time Rolex Farr 40 world champion skipper Belgiorno-Nettis, recaptured their customary form after day one’s mixed results added up to third overall. Three bullets and a second and third seemed on paper an ample turnaround. Then out came the red protest flag. Rod Jones’ Kindergarten finished third and guest tactician Malcolm Page, a dual gold medal winning Olympic sailor, said it was a pleasure to finally sail with Jones having known him a long time. “Rod steers the boat very well, he’s very new to the class but is showing early form. No doubt in six months’ time they’ll be a much better team and become a front marker in the world standings. The skill level is definitely there, now it’s just crew work and being able to perform when the heat is on. The good guys get going when the pressure comes on; Voodoo and Transfusion proved it. They are pretty polished,” Page added. There was plenty of elbow room on the harbour compared to yesterday when a large-scale Dragon regatta squeezed the Farr 40s seaward to the harbour’s edge and into fickle winds bouncing off the huge sandstone cliffs at North Head. Today PRO Ted Anderson raced the group off Middle Head and up into Little Manly Cove, adding fast ferry and big power boat wash to the list of variables. 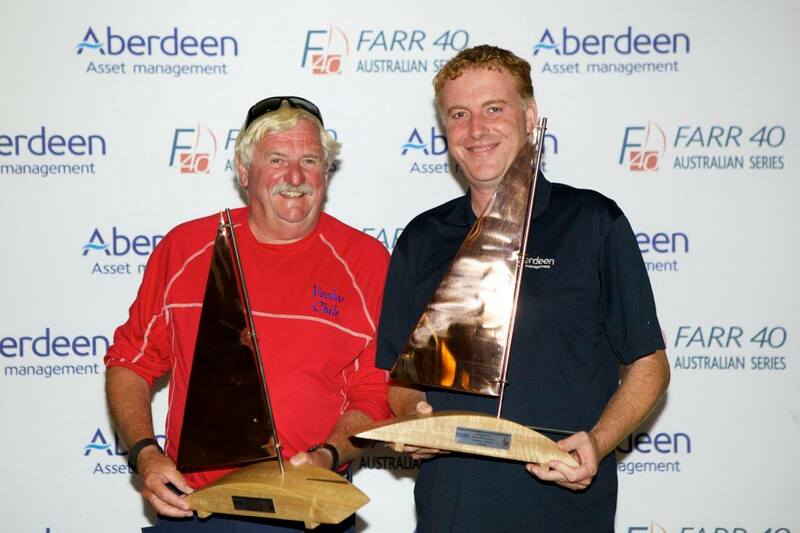 The third and final Farr 40 one design regatta prior to the John Calvert-Jones Trophy: National Championship, March 25-28, 2015 on Sydney Harbour hosted by the Royal Sydney Yacht Squadron, is the lead in Aberdeen Asset Management NSW State Title, March 21-23 (RSYS). The One Design Trophy regatta is supported by the class’ major sponsor for the third year, global investment management group Aberdeen Asset Management.